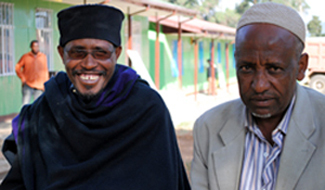 "Beyond support to our projects, EIFDDA is the only institution that came with the idea of interfaith collaboration, which is unique and encouraging," says Father Abeje (left). The town of Holeta sits 19 miles west of Addis Ababa. Not long ago, amid the hum of rural life laid an undercurrent of conflict. Holeta was experiencing many challenges, and the members of its four religious groups (Islam, Ethiopian Orthodox Christian, Catholic, and Evangelical) found themselves at odds with their neighbors from other faiths. "We looked at each other with bad eyes," says Father Woldegiorgis Abeje of the Ethiopian Orthodox Church. Although tribal ties in Ethiopia have waned, more than 90 percent of the population identifies with a religious group. This alignment in faith means that local religious leaders have a tremendous influence over their communities. But the lack of a unified front of religious leaders in Holeta made the town's challenges—including an increase in orphans and a high unemployment rate—hard to address. When the Ethiopian Interfaith Forum for Development, Dialogue and Action (EIFDDA)—the only consortium of faith-based organizations (FBOs) in the country—became aware of Holeta's inability to communicate on a basic level, they knew they had to intervene. Luckily, they had the skills, resources, and networks to do so effectively. In 2008, EIFDDA received a PEPFAR New Partners Initiative (NPI) grant from the U.S. Department of Health and Human Services to develop their organizational and technical capacity, and in turn the capacity of their nine FBO members, to sustainably address HIV in their communities. EIFDDA also received technical assistance to strengthen both its management and programmatic systems. This support was provided by JSI and its partner Initiatives Inc. through the Technical Assistance to the New Partners Initiative (TA-NPI). "Before, there was no smooth communication between the different religious groups in Holeta," says Yonas Dare, EIFDDA Program Department Head. TA-NPI worked with EIFDDA to determine how the organization could be strengthened. Trainings were then provided on finance and administration, governance, human resources, communication, monitoring and evaluation, and support to orphans and vulnerable children (OVC) and people living with HIV. It was with this support that EIFDDA was able to reach out to the religious leaders of Holeta and invite them to participate in a workshop to discuss the critical problems facing their community. At first, the intervention was not successful; the religious leaders simply preached to one another, trying to spread the word of their specific religion and did not address the reason why they had been brought together. EIFDDA used its enhanced communication and negotiation skills to redirect the heated discussion to focus on the mutual goal of improving the lives of Holeta's residents. Once they realized that they were there to achieve the same thing, the religious leaders of Holeta embraced the training. Over two days, they learned about care and support for OVC, general health and nutrition, sanitation, psychosocial support, HIV, elder support, and community mobilization. The leaders also recognized their collective power to affect community change, and created a formal interfaith forum to put what they learned into practice, and to raise funds to support Holeta's citizens with their own hands. "The training really helped us reach a new level," says Mudesir Shikur, a Holeta Muslim leader. "I learned I have to contribute myself." Indeed, EIFDDA's training allowed Holeta's various faith groups to realize their common values—including love, loyalty, hard work, and transparency—and use them to share experiences and coordinate community resources. To date, more than 40 members of local religious groups have been trained by EIFDDA. Nine interfaith forums have been created, each of which is in the process of legally establishing itself with the government. 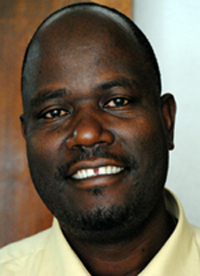 "We learned about helping each other, supporting orphans, and that our role as religious leaders is to mobilize the public, which is the most important thing," says Father Abeje. "Now we're like brothers."